Young women can and do get breast cancer. We believe that knowledge and understanding can make us all stronger. We hope these pages help you learn about breast cancer at your own pace—so you can feel more confident and in control of your health. From diagnosis to staging to the biology of breast cancer and metastatic disease, this is Breast Cancer 101. Learn the risk factors and signs and symptoms of breast cancer, and get the statistics on how breast cancer affects young women differently. Find out what it means to be a young woman living with breast cancer. Understand your treatment options and how they can affect your fertility and quality of life, including the practical matters. If you’re living with metastatic, or stage IV, breast cancer, we can help you take control of your health and live well in the face of a chronic illness. Our powerful resources will help you get educated and feel supported. Our searchable online resource database, downloadable guidebooks and recordings of past educational workshops will help you be a proactive advocate for your health. Young women, especially those with metastatic disease, are underrepresented in breast cancer research. Learn about our research agenda for breast cancer in young women and the outcomes of our Research Think Tank. Find clinical trials and ways to get involved with breast cancer advocacy. Breast cancer doesn't just affect the young woman diagnosed; it affects her loved ones, too. As a co-survivor, self-care is critical. Learn about ways to help yourself while helping her, and find ways to get involved and support the cause. Los siguientes materiales en español están disponibles exclusivamente para mujeres jóvenes afectadas por cáncer de mama. Find the answers to our most frequently asked questions about breast cancer in young women. From detection and diagnosis to treatment side effects to pregnancy and breast cancer, we’ve got you covered. Locate resources, listen to talks or order our valuable educational materials. Use our online breast cancer resource directory to find local and national resources for young women, co-survivors and healthcare providers. If you’ve missed any of YSC’s informative programs and events, you can still access many of them through our video and audio files. Take control of your health, with our Navigator series, guidebooks, and fact sheets which are packed with information on breast cancer. 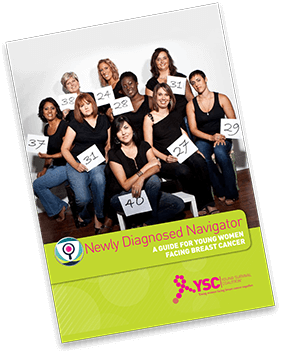 Created to educate and empower newly diagnosed women, our Newly Diagnosed Navigator helps fight the feelings of fear and isolation that can accompany a diagnosis so that you feel connected, supported and hopeful.